The hollyhock (Malva alcea) makes up approximately 60 species of flowering plants in the Mallow plant family. This hardy plant, native to southwest and central Asia and related to the hibiscus, grows in the wild but is also common in ornamental gardens. Although classified as a perennial because it comes back every year, it is also considered a biennial, as flowering could take place every other year. Hollyhocks do well in sunny locations that may be too dry or too hot for other plants. Hollyhock's genus, Alcea, is derived from the Greek word althea, which means "to cure." The name hollyhock probably resulted when crusaders brought this versatile plant to England. Holy and hoc (mallow) were the terms associated with it at that time. The sturdy plant gained popularity and became the subject of a well-known 15th-century poem. Years later, the hollyhock was introduced to America, and the 17th-century hollyhock was known as the Alley Orchid because it multiplied so quickly. The hollyhock flower can grow to about 9 feet tall. It produces multiple blooms on a central stem. These blooms are usually yellow or pink on plants that grow in the wild. Plants cultivated in the garden can produce blooms of a variety of colors. The most common color is red, but other colors include white, pink, yellow and purple. The most popular cultivar is the Alcea rosea. The heirloom cultivar "Nigra," with its almost-black flowers, is the most unique. The leaves of the hollyhock plant are large and veined. It has long taproots and produces multiple seeds. These flat, coin-shaped seeds seem to grow effortlessly wherever they fall. Because of their uprightness, hollyhock plants make a dynamic vertical appeal in garden spaces. Hollyhocks are very hardy plants that do well in USDA zones 2 to 10. They are also drought resistant. Not too many plants do as well as the hollyhock in locations that are extremely hot and dry. The longevity of this plant comes through the number of seeds it frequently sets. An individual plant may only live for two to three years, but the rate in which it reproduces ensures a continuance of hollyhock plants for many years. 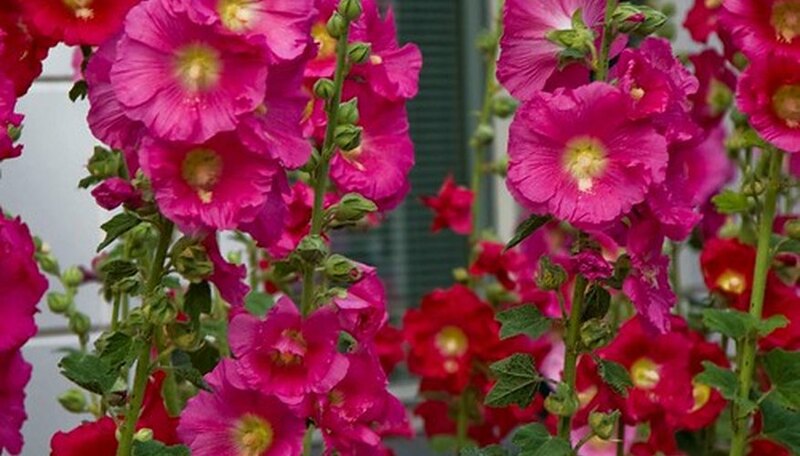 There are two types of hollyhock plants. The true hollyhock is of the Alcea species. This plant grows quite tall, has heart-shaped leaves and produces double blooms in a variety of colors. The Althaea species of hollyhock is recognized for its medicinal and healing properties. It is the shorter of the two species, has round leaves and as is known as the "marshmallow plant." The hollyhock flower has been used in a number of ways over the past years. It has been esteemed as a colorful cottage plant. It was used by the ancient Greeks and Chinese for its medicinal properties to treat ailments as indigestion, earache and toothache. The fruit and flowers of the Althaea species were used by the ancient Romans in culinary recipes. They have also been used for cosmetic purposes. Today, the hollyhock can still be creatively used as a doll for decoration or play.